We saw that the debate did generate attention and impacts but the effects dissipated as we got further away from that event in time. But the debate did have at least a short term impact and seemed to help Justin Trudeau and the Liberals somewhat and also gave a temporary boost to Elizabeth May and the Green Party. We suspect that it will take more concerted communication and exposure to sustain and build on these effects. That is why the future of the debates, particularly the English consortium debate (viewed by some 10 million Canadians last time) is so important. It is also important for other reasons. Notably, finding the sweet spot in the promiscuous progressive voter spectrum which signals a commitment to two things: 1.) progressive values and policies; and 2) an understanding that change of government is the top priority for those voters and party fealty is secondary. It is also our view that the traditional appeal of the center moderate position has been at least temporarily distorted by nine unprecedented years of rule from the right. Looking at disapproval of federal direction and second choice data, we get a clearer sense of the strategic challenges facing the contenders for government. While overall scores for direction of the federal government (and country) are horrible and approaching historical nadirs, the fractures across social class, age, and partisanship may be even more revealing. 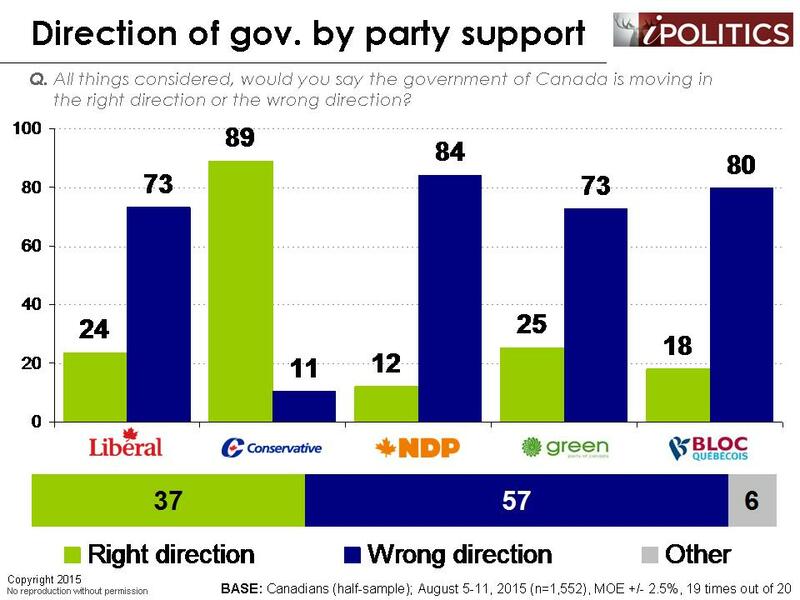 While only small minorities outside of the nearly universally approving Tory base think the government is moving in the right direction, the incidence of satisfaction is twice as high for Liberal and Green supporters as for the NDP. This gap is also reflected in the demographic constituency for the NDP who have risen on the strength of the university educated and age cohorts outside of seniors. These are precisely the groups which show the highest disaffection with the government. The NDP have, for the moment, emerged as the rallying point for those who are extremely disaffected and most committed to change. For the NDP, they have to continue to provide confidence to their supporters that they are the best antidote to the current political malaise that infects the progressive voters who are now in their camp. We suspect that a clear commitment to change of government as a priority (and openness to coalitions if necessary) has been critical to this success. It may also be the case that their blunter, progressive position on Bill C-51 has been an important ingredient of success. The issue of future debates therefore must be considered with caution in light of these dynamics. Bluntly, the current and available constituency for the NDP are not in tune with their current position on the consortium debate. Therein lies the predicament. In determining each party’s optimal strategy, the progressive parties have to weigh carefully how to focus on growth. The sheer political arithmetic is obvious. For both the NDP and the Liberals, by far the largest pool of available voters is each other’s supporters. 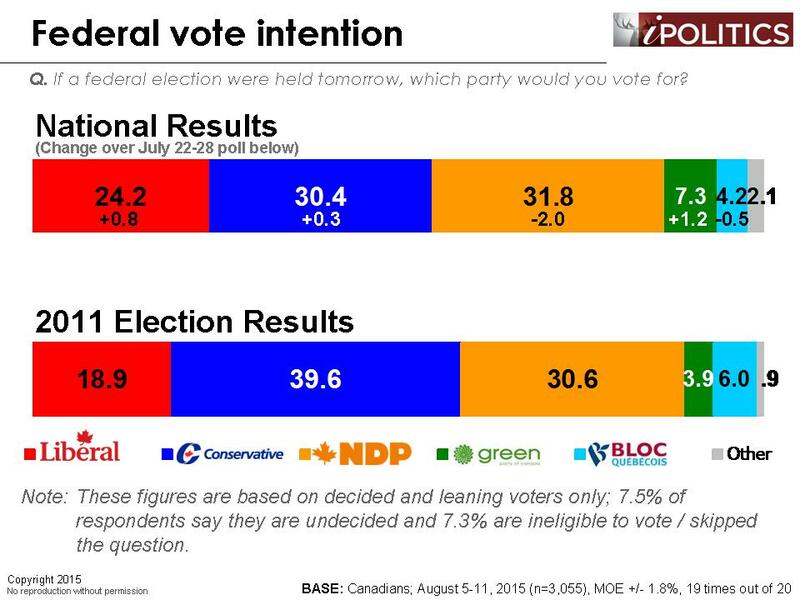 There is a near perfect symmetry of roughly 40 percent of both NDP and Liberal voters that would pick the other party. However, this strategy leaves the Conservative vote intact. Even though potential Conservative defectors make up a much smaller pool, it may be a more attractive strategy to entice would-be Conservative voters with a message that change is possible, but one that attracts centre-right Canadians as well. Roughly 15 per cent of Conservative supporters would consider either the Liberals or the NDP. Making progress with these voters may be fishing in a smaller pool but it does have the advantage of reducing the Conservative chances of success, which is a unifying and salient motivation for their supporters. This is an interesting and important strategic conundrum and it links to attitudes to coalitions, which we will show is very positive and rising (next week’s poll). It may be that voters now favour progressive government over any single party solution to the majority appetite for change of government. This week, we asked Canadians about their thoughts on the August 6th leaders’ debate. Long story short, there was no winner. 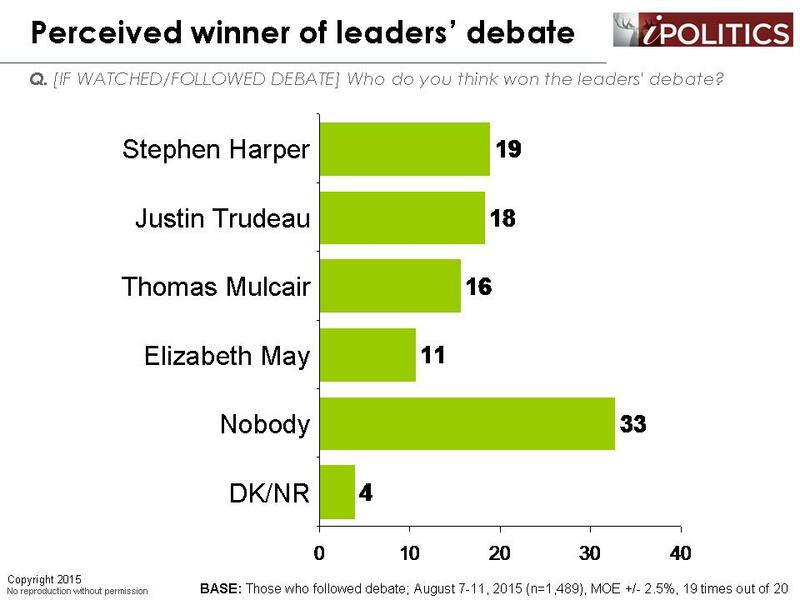 Mr. Harper and Mr. Trudeau did well, but the clear winner of the debate was ‘none of the above’. On the issue of further debates, we seem some interesting results on the issue of who should or should not attend. Clear majorities of Green, NDP, and Liberal supporters say all four federalist leaders should be present for all debates. 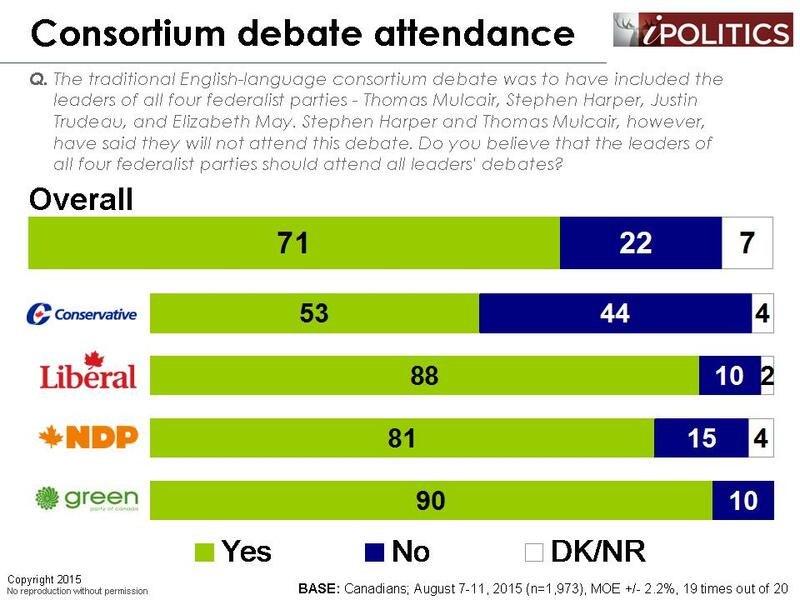 These results suggest that Mr. Mulcair needs to be cautious when it comes to the debate around the debates. The very reason he appeals to Canadians is because he’s tapping discontent with government. In the case of the debate, Mulcair does not want to see himself in the same box as Harper (indeed, 81 per cent of his supporters think he should participate). We understand why the NDP might not want Green Party present at the debates – it is clear they are toe-to-toe in some ridings in British Columbia. However, refusing to debate the Green Party will, at best, deny the Green Party one to two seats (and this is a generous estimate). The voters who are angry over his refusal to participate, however, may well cause far more serious losses, as the promiscuous progressives are a highly fluid group. Indeed, in this case, the potential downside to not participating certainly outweighs the upside. 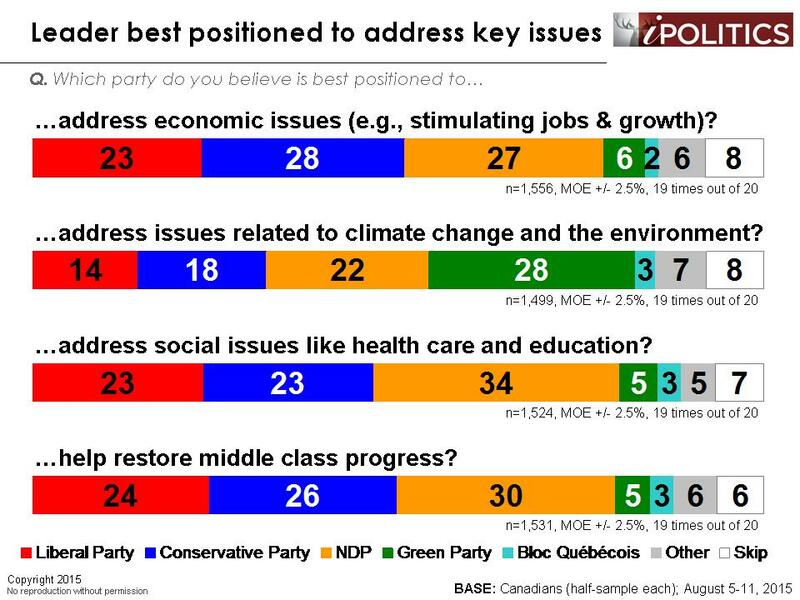 We also asked Canadians which party they felt was best poised to address a number of different issues. Looking at what is consistently ranked as the most important election issue – the economy – responses almost perfectly mirror vote intention. 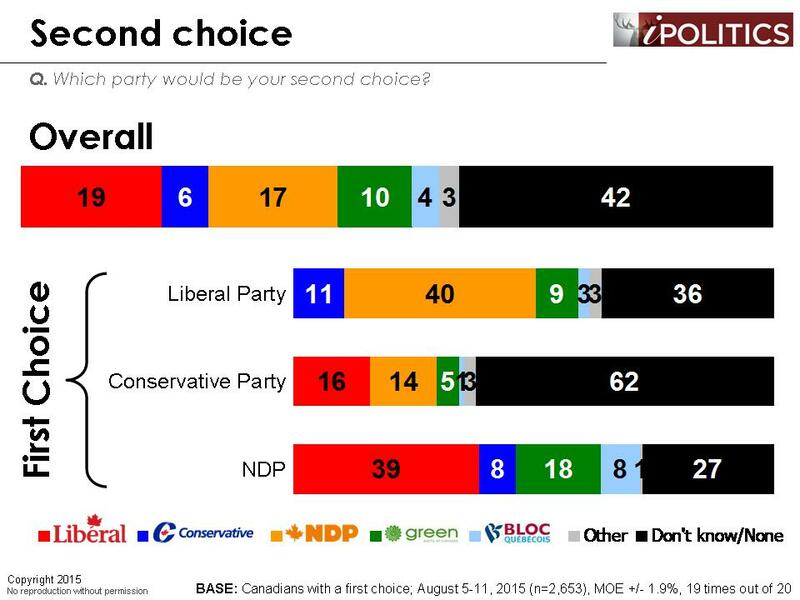 Clear majorities believe it is their party that is best positioned to lead the economy (with the exception of Green Party supporters who would seem to be more comfortable with the NDP taking charge). The game in on here and the principal job of the opposition parties will now be to draw attention to the poor state of the economy and to convince that they are the best positioned to restore a confident and prosperous Canada. Interestingly, the Green Party leads on environmental issues, suggesting that Elizabeth May has done very well in terms of championing herself as the most committed source on what has effectively become an orphaned issue. The Liberals trail – but are still in the hunt – on economic and social issue but may want to redress their clear gap on environmental issues where they trail all, even the Conservatives. The NDP has a firm advantage on social issues and holds a slight lead on restoring middle class progress. Stephen Harper, meanwhile, does not have a clear advantage on any of these issues and his best option at this point may to hammer away at issues related to security at terrorism, which has generally worked well for them in the past. Unfortunately, in the absence of a high-profile terror episode, this becomes a more difficult challenge. As the moral panic associated with the shooting on Parliament Hill and the ISIS atrocities has faded, so has support for a strengthened security agenda, as well as Harper’s prospects for success. Trade has never been a particularly polarizing issue for Canadians — at least not since the 1990s. Indeed, eight in ten Canadians support the concept of free trade in North America and a clear majority would support some form of pan-American free trade agreement. The Trans-Pacific Partnership is a special case in that the agreement is still being negotiated and details have not been made public. So voters have been left to speculate on the basis of online rumours — some plausible, some downright silly. The Harper government has done little to address these concerns. 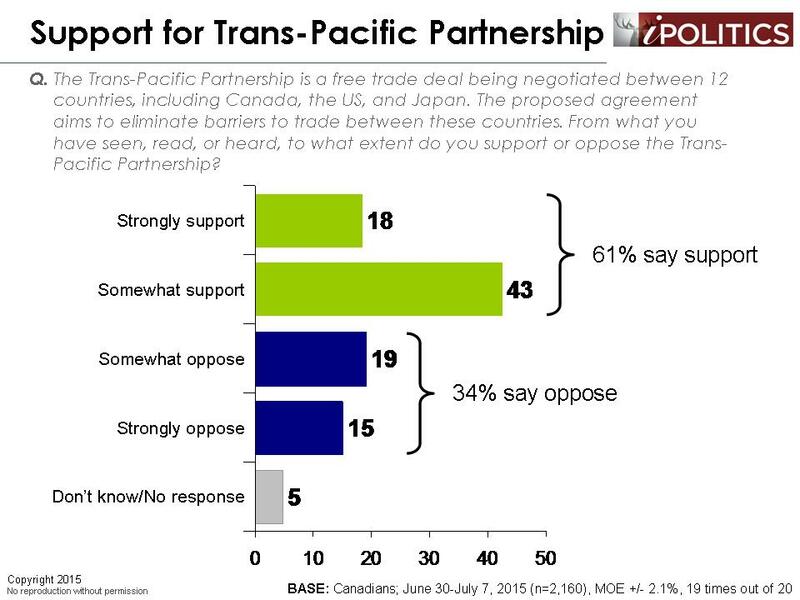 Nevertheless, by a margin of nearly two-to-one, Canadians appear to support the Trans-Pacific Partnership. Support is fairly tepid (43 per cent of Canadians ‘somewhat’ support the agreement), which suggests that many Canadians don’t feel sufficiently informed to take a firm stance one way or the other. The TPP talks are rolling out against a backdrop of softening support for trade liberalization in general, undoubtedly linked to rising economic anxieties. Canadians remain solidly pro-trade but are less enthusiastic than they were in the early days of the century. This study draws on data from two separate surveys, both of which were conducted using High Definition Interactive Voice Response (HD-IVR™) technology, which allows respondents to enter their preferences by punching the keypad on their phone, rather than telling them to an operator. In an effort to reduce the coverage bias of landline only RDD, we created a dual landline/cell phone RDD sampling frame for this research. As a result, we are able to reach those with a landline and cell phone, as well as cell phone only households and landline only households. The field dates for the first survey are June 30-July 7, 2015. In total, a random sample of 2,160 Canadian adults aged 18 and over responded to the survey. The margin of error associated with the total sample is +/-2.1 percentage points, 19 times out of 20. The field dates for second survey are August 5-11, 2015. In total, a random sample of 3,055 Canadian adults aged 18 and over responded to the survey. The margin of error associated with the total sample is +/-1.8 percentage points, 19 times out of 20. That’s the problem with our Country right there. Ignorance and lack of education. So what I take away from this is that the current Conservative government is supported by poorly educated seniors – ha, what a laugh! Those younger & better educated are disappointed – gee, what a surprise. The sad thing is, the uneducated seniors are more likely to vote & least likely to consider any option but the Conservatives, which is natural considering the very definition of the word. Obama won in the USA by harnessing the disaffected & the lazy through social media, so one might guess that the party that woos the most disaffected & lazy voters out might win; I would guess that the Conservatives can’t increase support that way, the game is for the Liberals & NDP to lose. As usual, I fear they will merely split the vote, thus, letting the Conservatives maintain at least a minority government. That would be extremely dangerous for Canada, since the only plan the Conservatives have for the economy is based upon resource extraction, particularly oil & gas which are doomed & dying since the USA has found its own plentiful supply in shale for the next 30 years or more. In the meantime, surprising new energy sources will emerge leaving Canada to rot in the dust bin of history if under Conservative leadership which only stimies innovation, cuts R&D funding like for the experimental federal farms, dismantles our competitive edge as through the dismantling of the Wheat Board, & refuses to invest in fusion research because its funding comes largely from petroleum companies. Jack, I agree with you. Harper is one of the most dangerous PM in Canadian history. His C-51 bill is the worst thing that can happen to our freedom & democracy. There were 36 million lives lost in WW1 & 60 million lives lost in WW2 to gave us this freedom we have today and Harper shove it down the drain because of the “terrorism” that the US hegemon has drawn Canadians in. I am frustrated that Canadians, like the Americans, have been brainwashed by Washington and too blinded to see the truth: We all know that the invasion of Iraq for possession of nuclear weapons after the 911 attack was a big lie, yet somehow Washington lead us into believing it!! On one hand, Washington supports the Jewish State of Israel; while on the other, the Islamic State of Saudi Arabia, 2 extremely polarized regimes, at war with each other since the creation of the Jewish state. Why? Because Israel is backed by the international Zionist bankers in Wall Street and the Federal Reserve (a corrupt private bank. Please watch “Inside Job”, directed by Charles Ferguson, narrated by Matt Damon (available in public libraries or online) by Sony Pictures for an analysis of the 2008 global financial meltdown. SAUDI ARABIA controls the world’s oil supply backed by the Bush families, Bin Laden group, Saudi crown princes, etc. Furthermore, it is the US military that has been fueling these wars and conflicts by supplying weapons to this region, as well as other parts of the world for conflicts which the US itself created, through the Carlyle Group (owned by Bush families, James Baker III and Ex-British Premier John Major: Please see attached article from a venerable UK information source on the Carlyle Group: http://www.informationclearinghouse.info/article3995.htm. The richest 1-2% of the US & have been playing the geopolitics games by using wealth, oil, and advanced weaponry, under the DISGUISE of RELIGION to deceive and manipulate the world. The end result is international terrorism, bankruptcies of nations around the globe & their people; and wreak havoc on earth. 10 years ago, Canada was no. 1 on UN’s OECD Human Development Index, now we are No. 8, falling behind the Scandinavian countries and the EU; now 1 out of 10 Canadians live in poverty; our debt to GDP index has doubled because of household debt. Now with China and other parts of the world in recession, our oil revenues will also take a dive as well. The Scandinavian countries & EU are already leading us in greener technologies and if Canada does not try to catch up, we will be left in the dust bin. Basically, Harper has let other countries colonize Canada by putting our natural resources into foreign hands!!!!!! If any one carefully looks at the economic proposals of both the NDP and Liberals, they will finds that the proposals of both parties involve tax increases across the board. It is a sad state of affairs when we have to listen to political rubbish and lying promises about what non-governing parties would do if they were elected. Both you and I know that politicians will promise all kinds of things to get into office, and 90% of the time they never keep them. I for one, am tired of debates filled with interruption’s where no one gets to fully complete a thought process. I for one am sick and tired of lies, broken promises and half truths. I for one am sick and tired of foolish Canadians who are so stupid that they think that no one is going to have to pay for these “freebies” that are being offered. If you want to pay more tax, if you want increased user fees for Parks, if you want to gut the oil engine that gave us the little prosperity we now enjoy, go ahead vote NDP, Liberal or Green, they all believe the same thing. And if you think for one moment that the NDP and liberals will not form an alliance to subvert a minority Conservative Government, you don’t know your Canadian History very well. The world is in financial crisis folks, not just Canada. Under the leadership of Mr. Harper Canada has been well guided. If anyone out there thinks that either Trudeau or Mulcair can do a better job, give your head a shake or better yet stick it in a pail of cold water and take a real deep breath! You don’t have to raise taxes if you have the right priorities. Harper has led the worst performing economy since the second world war. On what planet do you think this morally bankrupt and totally corrupt government should be allowed to govern because Earth has had quite enough thank you very much. Furthermore the world is in financial crisis for reasons that cannot be laid at the door of the NDP or other progressive governments. It is deregulation and right wing laissez faire market policies that are to blame. That pail of icy cold water is standing by – take advantage. Right, because, when has increased regulation ever led to increased growth, success, and prosperity? And totally corrupt? Sure, all I can say is 2.7 million dollars #ndp. 100% agree with you Gary Roberts… Good to know there is at least one other person that has a brain in this country and isn’t falling into the NDP or liberal hypnosis that is plaguing this country!!!!! All I know is that Harper may not be open, or a friend to media, but I say no to any higher taxes, or leftist environmental policies, I’m sick of it. Justin Trudeau is athletic, who cares. Tom mulcair is more open. Who cares. Stephen Harper had the best leadership out of the three clowns , so I am not concerned. Right. Well I, for one, “am sick and tired of foolish Canadians” blindly supporting unsustainable economic growth at the expense of our own ecosystems and the entire planet. We cannot have a government that gags our scientists, guts our environmental laws, continues to subsidize oil, and expect to get anywhere in the race to develop desperately needed renewable energy. We CANNOT continue on the way we have in the past. Ask the 97% of climate scientists that have been warning us over the years. How can people not see the big picture? The Conservative environmental platform is weak to non-existent, and what little is there has been directly contradicted in practice since they’ve been in office. Please explain to me how any educated person can justify this? Also, “the oil engine that gave us the little prosperity we have”? Are you kidding me? The energy sector is about 6% of Canada’s GDP, oil and gas alone is maybe 2%, so don’t kid yourself (check Stats Canada). We need to be proactive and start making the transition away from oil. Period. The Conservatives will not do that. Do you have information about the second choice of those who intend to vote for the Bloc and the Green party? Another thumbs up to Gary Roberts. You said it all and I couldn’t agree more. 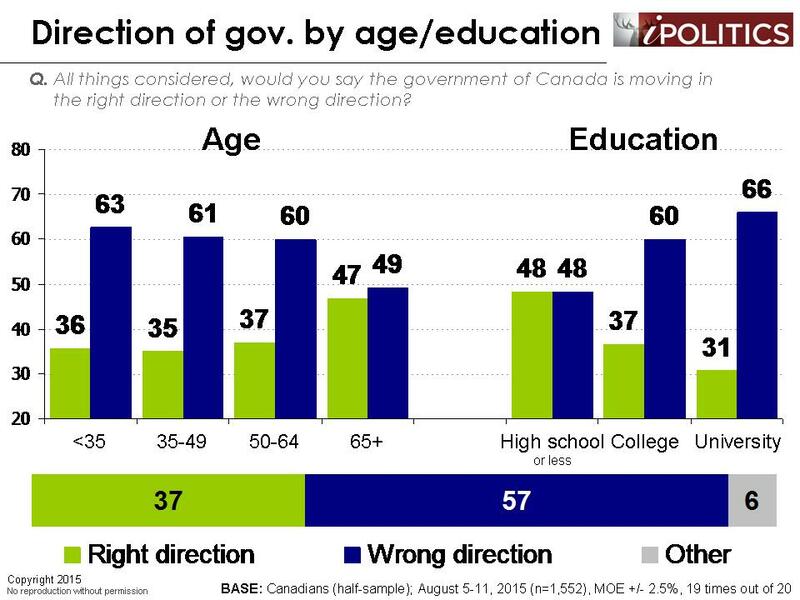 As the polls indicate Conservatives appeal disproportionately to seniors with lower levels of education. The “Angry Conservative Men” and “Ford Nation” supporters are what allow the party to be in contention. The platforms of the NDP and Liberals don’t involve tax increases across the board and the three opposition parties have some very significant differences between them. 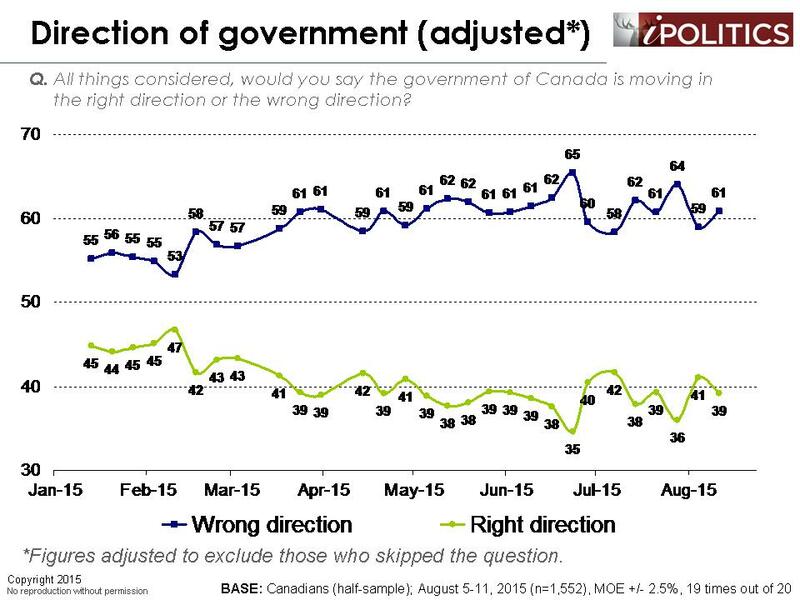 The problem with the Canadian electorate is that it is grossly uninformed and disengaged. 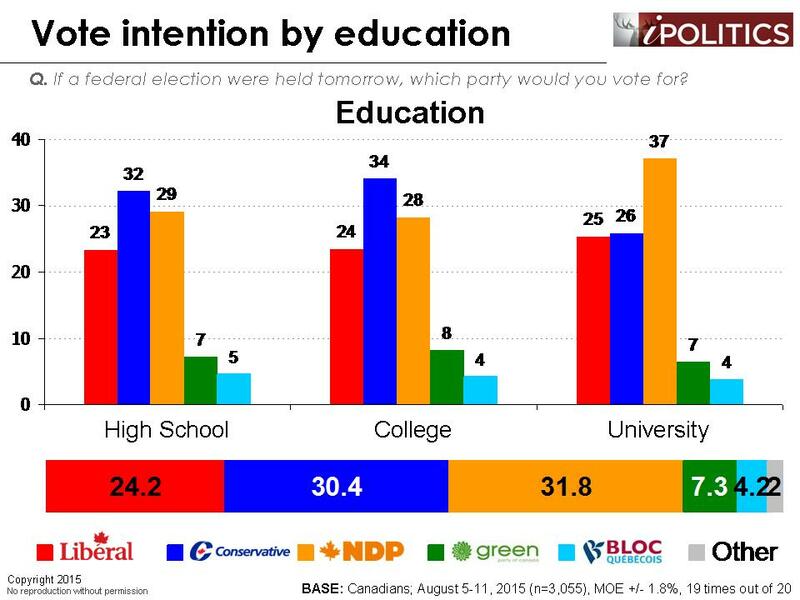 Even under our flawed voting system, Harper couldn’t be in contention with an educated, informed and engaged citizenry. I agree with Gary Roberts as well. And Brandon we are not minority who can see through the empty tax and spend promises of JM & TT who only talk about spending more but dont reveal their evil plans where they gonna bring that money from. I am fully optimistic that there will be another majority Conservative government. How are these types of polls conducted? I have never been contacted to take part in a election poll since I became the legal voting age in 1998. Agreed with Gary. There seems to be many Harper haters on this website, who take pleasure only in demonizing him, rather than having a genuine interest in politics. Personally, I find the current state of politics extrememly bad as Gary points out, but I also find the serial whiners about Harper very tiresome. While I applaud several efforts by Stephen Harper during his reign, economics and concern for our natural resources was certainly not one of them. He seems content with selling off the equity of Canada to the detriment of our children and their descendants. I’d rather stop that bleeding wound before it festers. I see a master of rhetoric at work in the NDP, and that makes me distrustful. While the leader of the Liberals may be young for the part, he understands the perspective of emerging generations brought up in a rapidly changing technologically-driven globalized society, and this is something worth noting. A fresh perspective is exactly what our Country needs right now, and I have to wonder whether the old masters of influence have their eyes open to the changing reality of our globalized world. How can 61% of Canadians support the TTPA? The articles of this agreement have intentionally been kept secret by the governments. The little information that is available has become so only because of the efforts of WikiLeaks. The contents of which suggest that the Trans Pacific Partnership Agreement would have severe economic consequences on Canadian businesses, corporations, and farmers. Additionally, the intentional segregation and exclusion of global economies that the U.S. does not approve of threatens to further diminish global economic prosperity, but international co-operation and peace as well. Mr Roberts would have you believe that 65% plus of the population is wrong & Harper & his gang of Lying MP’s have it right. Harper has overspent @ a rate of 17 billion each year since being PM.I could look good too if that amount of borrowed money to spend. What Roberts is missing is the amount of damage he has done elsewhere, we may never be able to repair it, ask the Scientists he has gagged or fired for trying to tell us the truth. Is this the kind of man you want to run our country, what’s left of it that he has not sold off to Chinese & others. 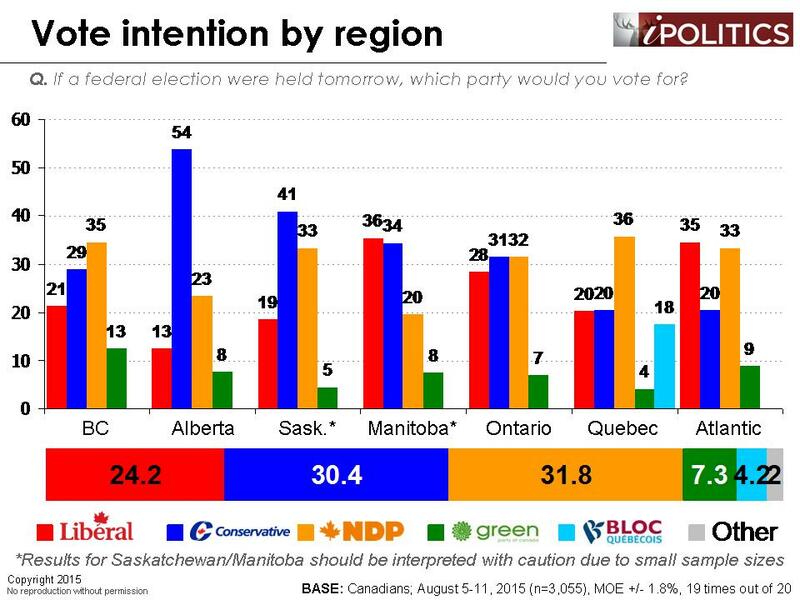 In a well educated country Harper would be hard pushed to get 5% of the vote. Save our country & vote for Canada, ABC. Brandon it took the Liberals 13 years to fix the mess Mulroney left us. Harper took the $13 billion surplus the Liberals left & blew the lot in 16 months well before the recession, where did that money go?. HE makes Mulroney look like a saint. There is not a word in the English language to describe him & his government. Pretty surprised with the number of blind, uneducated Harperites in this comment section. Harper’s base support is strong. Crushing them will be historical. Well I do agree with Mr Roberts, all these people that think raising taxes is the answer for more programs and more government,is it because you don’t pay taxes or you want our children to pay for the debt when you are dead. I could see if your so gun hoe to wreck our economy and support the environment by any means why don’t you take the first step and go live in a tent in -30 temperatures I know your environment footprint will be small, be the leader and take the first step in what you believe, but I honestly don’t think you will. Currently, oil is our lifeline, we can ween ourselves off it slowly but (Rome wasn’t built in one day) but you just can’t go and kill it. I suggest no government transfers to provinces and see how the tree huggers change their minds when someone else (us the taxpayers) are not supporting them with their government programs. Sick and tired of working to support some of the laziest people that think everything should be given to them. You want to make a difference go work. As for politicians there all corrupt but I have seen NDP wreck provinces where ever they have had power for any length of time and I think if 1/3 of my pay is going to taxes that is sure enough, can you say the same. To continue this discussion, I still fully support Stephen Harper, and realistically the NDP cannot run balanced budgets with only slight corporate tax increases, combined with small business tax decreases, and, as they continue to claim, no raises in personal income tax. In fact, I will be a rebel and even say I wish to see DECREASED, thats right, DECREASED taxes, and less government. In terms of Justin Trudeau and the Liberals, they claim to be the party of balanced budgets, yet are committed to running 3-4 deficits anyways to pay for things like, extra first nations money. Are you kidding me? More taxpayers money to the FN, more encouragement for certain reserves to do less than nothing, oh, and absolutely nothing mentioned about the corrupt chiefs ruling over these poor people. Ab Huskic also has a valid point in saying that if you are so concerned about the environment, be a leader, be more “progressive”, if you will. And I continue to say no, to anti-economy anti-development armchair warrior lefties, who could not, for their lives, get out and work, and instead need the upper class to pay even more for programs for them. Don’t lie, the upper, and heck, even the middle class, pay more than their fair share for public services, so that the unproductive environmentalists can take even more $. 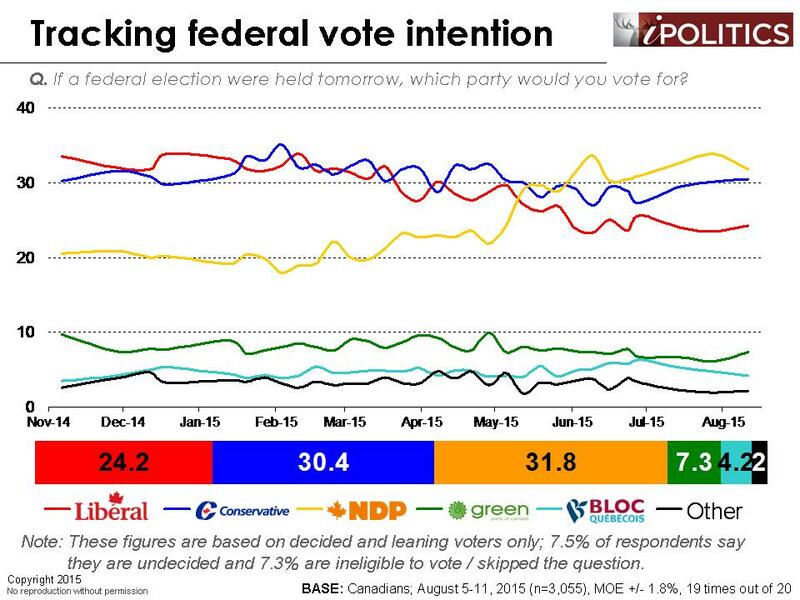 that shrinking conservative vote in alberta doesn’t seem to be going to the other parties. 54–>47, with movements from the other parties wavering amongst themselves, within a small margin. where are those voters actually going? are they provincial wildrose voters?